The objective of the ACWI Premium Plus model is to track and produce similar or improved risk adjusted returns of the MSCI ACWI (All Country World Index) while reducing overall volatility. 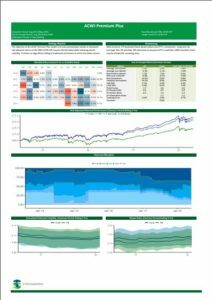 These models use the MSCI ACWI as an input for tracking in the algo, but provide you with exposure exclusively to highly liquid US Risk Factors. The objective of the ACWI Premium Plus Tracker model is to track and produce similar or improved risk adjusted returns of the MSCI ACWI (All Country World Index) while reducing overall volatility. These models use the MSCI ACWI as an input for tracking in the algo, but provide you with exposure exclusively to highly liquid US Risk Factors. These strategies were developed using our Fund Cloning methodology. Disclaimer: Past results are not necessarily indicative of future results.